Nonalcoholic fatty liver disease (NAFLD) is a growing cause of chronic liver disease worldwide that can manifest as nonalcoholic fatty liver (NAFL) or nonalcoholic steatohepatitis (NASH). Compared with NAFL, NASH poses a substantially higher risk of progression to advanced liver disease, cirrhosis and hepatocellular carcinoma (HCC). Given the lack of directed pharmacological therapies and the complex, multifactorial disease aetiology and pathology, NAFLD is expected to become the leading cause of end-stage liver disease in the coming decades. Preclinical research aimed at elucidating the molecular mechanisms driving disease and identifying reliable biomarkers and potential treatments is critical and has gained significant attention in recent years. Several animal models attempt to mirror the histopathology and pathophysiology of each stage of human NAFLD, including the development of NASH and fibrosis, up to HCC development. 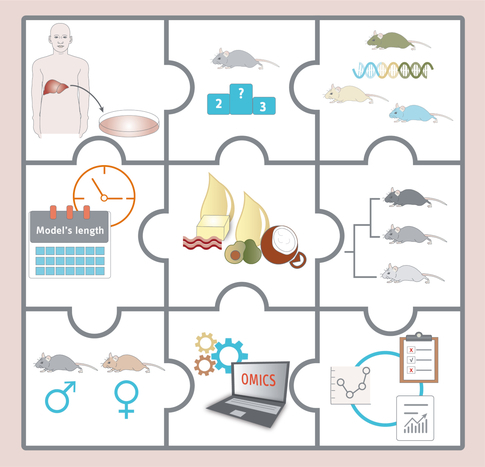 Most in vivo studies use mouse models owing to their relatively low cost, short lifespan and ease of genetic manipulation, which allow for a level of experimental control that is not possible with human studies. Independent of each model’s inherent advantages and disadvantages, making a mistake when choosing, performing, or even analyzing results for a particular animal NASH model may jeopardize our ability to obtain accurate results or draw firm conclusions. Here, we discuss some mistakes commonly made in NASH preclinical research. We also consider the challenges and opportunities when selecting animal models for the study of NAFLD. Despite the undeniable value of animal models for studying NASH, ethical concerns have been pushing experimentation towards the increased use of in vitro cell systems. Furthermore, while animal models will always have translational limitations due to species differences, human in vitro systems are increasingly gaining physiological relevance and may provide a more faithful representation of disease biology. Human in vitro systems therefore allow for a clear and independent focus on specific mechanistic aspects of the disease, without the need for animal models. Organotypic liver in vitro systems thus embody viable alternatives for select animal experiments, including preliminary evaluation of drug safety and hepatotoxicity. Upon evidence of clinical translation, promising drugs can be thoroughly evaluated in vivo. For example, a microfluidic in vitro system (comprised of primary human hepatocytes, stellate cells and Kupffer cells) exposed to circulating FFAs, glucose, insulin and inflammatory cytokines was shown to reproduce select transcriptomic, cell-signalling and pathophysiological changes observed in NASH (e.g. increased de novo lipogenesis [DNL], gluconeogenesis and oxidative stress, cytokine production and stellate cell activation).5,6 Furthermore, obeticholic acid, which is currently undergoing clinical trials as a potential treatment for NAFLD, has been evaluated in this system, eliciting strong antisteatotic, anti-inflammatory and antifibrotic effects,5,7 further highlighting the usefulness of in vitro systems for anti-NASH drug testing. Nonetheless, most genetic NASH mouse models comprise gene mutations that are not commonly altered in patients (e.g. ob/ob, db/db, foz/foz mice and others). In this case, the value of these models lies in the ability to study isolated pathways that are involved in metabolic homeostasis, as well as the consequences of their dysregulation. It is also possible to model advanced NASH using genetic models through the application of additional stimuli, usually in the form of a modified diet, leading to development of inflammation and fibrosis.13,14 In comparison with traditional dietary models, these “mixed” models generally exhibit a more severe disease phenotype within a shorter time period, thus increasing their attractiveness from a practical and/or economic perspective. Most NASH animal models need a long period of time to achieve a certain phenotype. For instance, depending on the model, it can take up to 4 months to achieve different degrees of steatosis, with or without significant necroinflammatory changes. Development of fibrosis usually requires additional time and is often mild, if present. Finally, most models trying to reproduce the natural disease course, up to the development of HCC, require an experimental period of 12 months, on average. In practice, temporal resources are often limited and animal models requiring a long experimental duration can be extremely costly, particularly when a preclinical lead is being tested. For this reason, it may be appealing to reduce the duration of the model. Unfortunately, this almost never is a good choice—the extreme diversity of the NAFLD disease spectrum means that animal models of NASH are also inherently variable, and the histopathological features are not always consistent. For instance, in most animal models of NASH progressing to HCC, neoplastic nodule numbers, size and degree of malignancy vary from animal to animal and are often unpredictable. Trying to reduce the length of time required for an animal model to display a given phenotype only serves to increase phenotypic variability and can even prevent the desired phenotype from being obtained. Of course, although it is possible to add a carcinogen or use certain modified diets to shorten the time needed for disease development and/or neoplastic nodules to appear, there will be an extra layer of complexity that must be appreciated and dealt with when interpreting the data. Last, but not least, the amount of fat included in the diet (regardless of the fat type), is also not standardized, generally ranging from 30–60% of energy content. This variation can also significantly impact experimental outcomes. An overview of the differential effects of distinct fat-source diets on rodent liver bioenergetics and oxidative imbalance was published by Kakimoto and Kowaltowski in 2016.15 Overall, for any type and amount of fat in a NASH diet, and to increase future reproducibility in this area, the composition of the HFD and control diet should ideally be paired, with the only notable change being the fat content itself. It is also recommended that the content of the diet should be clearly specified in publications, for both the control and HFD groups, particularly with regard to the source and type of dietary fat. In parallel with the macronutrient and fat composition of a diet, as well as the duration of feeding, the genetic background of the mouse strain used also determines disease severity. Although most models rely on C57BL/6 mice, it is important to recognize that other strains or recombinant inbred strains could be more or less susceptible to NASH development. Even the mouse substrain should be carefully chosen prior to any experiment, as key differences may exist. C57BL/6J mice are more insulin resistant compared with C57BL/6N mice.13 Intriguingly, it has been reported that C57BL/6J mice from The Jackson Laboratory may carry a spontaneous mutation in the nicotinamide nucleotide transhydrogenase gene (NNT) that could affect mitochondrial function and hence NASH development, but not C57BL/6J mice from other suppliers, nor C57BL/6N mice.15 This calls for awareness when selecting the supplier of any given mouse strain. Men and women exhibit major differences in NAFLD susceptibility and severity and, similar to the situation in humans, male rodents appear to be more susceptible to the development of NASH than female rodents. Largely for this reason, most published in vivo studies use only male animals. The opportunity to study particular risk factors and pathophysiological molecular and cellular circuits in women that account for this differential susceptibility to disease development should not be missed. For this reason, more female-only mouse models of NASH are eagerly anticipated. Furthermore, when accompanied by male mouse studies, they might aid the development of novel and more precise directed therapies for NASH. More recently, Tsuchida et al. described a NASH mouse model with rapid progression of extensive fibrosis and HCC.32 They performed global transcriptome profiling of the liver and HCC tumour tissues from their mouse model and also of two human NASH cohorts and several previously published diet, chemical, and/or genetic NASH mouse models. Their animals were shown to have dysregulated molecular signatures similar to those of early/mild human NASH. Animals developing tumours at later time points also had a transcriptomic pathway similar to human HCC molecular subclasses.32,33 Such work highlights the power of omics in elucidating more meaningful animal models that parallel human disease progression. That the results of animal research should be published only when they conform to agreed international standards, namely the ARRIVE (Animal Research: Reporting of In Vivo Experiments) guidelines, is undeniable.34 While fundamental animal experimentation rules should be followed, including humane and healthy animal husbandry, as well as following ‘the three Rs’ (replacement, reduction and refinement) policies, ARRIVE recommendations also include reporting extended details of the animals used, such as strain/genetic fidelity, use of littermates and the specifics of diet/nutrients. As stated previously, these represent crucial factors in NASH animal models. However, it should not be interpreted that unexpected/negative results should not be reported or published, as this may contribute to suboptimal interpretation of animal data, particularly when describing a new in vivo NASH model. Given the complex aetiology and pathology of human NASH, and the absence of a single animal model featuring all of its components (and with each existing model having their inherent strengths and weaknesses), it is likely that false positives, false negatives and/or inconclusive data will be obtained. A typical example is failing to achieve the reported phenotype of a particular model and deciding not to publish those findings. Provided the ARRIVE recommendations were followed, making the results available should be encouraged, either via specialized journals or through an online dataset, as this information is vital for the research community. These data are particularly relevant for drug development studies—without them preclinical leads could advance to clinical trials based on incomplete, critical information. Given the exploratory character of preclinical animal studies, outliers are often neglected when interpreting study data, although they should ideally always be reported. To circumvent potential bias, eligibility and exclusion criteria should be defined a priori and experiments performed in a blinded and randomized fashion. Failing to do so has been shown to increase the odds of reaching statistically significant results more than threefold when compared with appropriately designed studies.35 Even for appropriately designed studies, outliers are to be expected, particularly for normally distributed data and large sample sizes—roughly 1 in 22 observations will differ by twice or more the standard deviation from the mean. 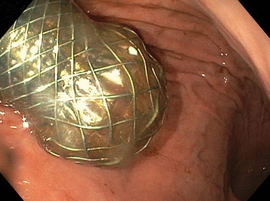 Whatever the case, outliers should always be carefully examined to establish whether they actually reflect end spectrums of NAFLD pathology (or treatment) or are the result of experimental artefacts.36 Furthermore, excluding outliers in a targeted fashion (that is, considering whether or not it supports the expected results), may have extreme consequences with regard to false positives and skewed interpretation. In summary, given the many different NASH animal models used by researchers, outliers should not be neglected. Outliers may provide crucial information about the intrinsic characteristics of the model or, in drug development, the intrinsic characteristics of the compound being studied. Ijssennagger N, et al. Gene expression profiling in human precision cut liver slices in response to the FXR agonist obeticholic acid. J Hepatol 2016; 64: 1158–1166. Oseini AM, et al. Translating scientific discovery: the need for preclinical models of nonalcoholic steatohepatitis. Hepatol Int 2018; 12: 6–16. Willebrords J, et al. Strategies, models and biomarkers in experimental non-alcoholic fatty liver disease research. Prog Lipid Res 2015; 59: 106–125. Nakagawa S, et al. Molecular liver cancer prevention in cirrhosis by organ transcriptome analysis and lysophosphatidic acid pathway inhibition. Cancer Cell 2016; 30: 879–890. Feaver RE, et al. Development of an in vitro human liver system for interrogating nonalcoholic steatohepatitis. JCI Insight. 2016; 1: e90954. Friedman SL, et al. Mechanisms of NAFLD development and therapeutic strategies. Nat Med 2018; 24: 908–922. Boeckmans J, et al. Human-based systems: Mechanistic NASH modelling just around the corner? Pharmacol Res 2018; 134: 257–267. Haas JT, Francque S and Staels B. Pathophysiology and mechanisms of nonalcoholic fatty liver disease. Annu Rev Physiol 2016; 78: 181–205. Haczeyni F, et al. Mouse models of non-alcoholic steatohepatitis: A reflection on recent literature. J Gastroenterol Hepatol 2018; 33: 1312–1320. Hansen HH, et al. Mouse models of nonalcoholic steatohepatitis in preclinical drug development. Drug Discov Today 2017; 22: 1707–1718. Wolf MJ, et al. Metabolic activation of intrahepatic CD8+ T cells and NKT cells causes nonalcoholic steatohepatitis and liver cancer via cross-talk with hepatocytes. Cancer Cell 2014; 26: 549–564. Mann JP, Semple RK and Armstrong MJ. How useful are monogenic rodent models for the study of human non-alcoholic fatty liver disease? Front Endocrinol (Lausanne) 2016; 7: 145. Santhekadur PK, Kumar DP and Sanyal AJ. Preclinical models of non-alcoholic fatty liver disease. J Hepatol 2018; 68: 230–237. Ibrahim SH, et al. Animal models of nonalcoholic steatohepatitis: eat, delete, and inflame. Dig Dis Sci 2016; 61: 1325–1336. Kakimoto PA and Kowaltowski AJ. Effects of high fat diets on rodent liver bioenergetics and oxidative imbalance. Redox Biol 2016; 8: 216–225. Riordan JD and Nadeau JH. Modeling progressive non-alcoholic fatty liver disease in the laboratory mouse. Mamm Genome 2014; 25: 473–486. Wang ME, et al. Increasing dietary medium-chain fatty acid ratio mitigates high-fat diet-induced non-alcoholic steatohepatitis by regulating autophagy. Sci Rep 2017; 7: 13999. Arsov T, et al. Adaptive failure to high-fat diet characterizes steatohepatitis in Alms1 mutant mice. Biochem Biophys Res Commun 2006; 342: 1152–1159. Bell-Anderson KS, et al. Coordinated improvement in glucose tolerance, liver steatosis and obesity-associated inflammation by cannabinoid 1 receptor antagonism in fat Aussie mice. Int J Obes (Lond). 2011; 35: 1539–1548. Asgharpour A, et al. A diet-induced animal model of non-alcoholic fatty liver disease and hepatocellular cancer. J Hepatol 2016; 65: 579–588. Ganz M, Csak T and Szabo G. High fat diet feeding results in gender specific steatohepatitis and inflammasome activation. World J Gastroenterol 2014; 20: 8525–8534. Stoppeler S, et al. Gender and strain-specific differences in the development of steatosis in rats. Lab Anim 2013; 47: 43–52. Fujii M, et al. A murine model for non-alcoholic steatohepatitis showing evidence of association between diabetes and hepatocellular carcinoma. Med Mol Morphol 2013; 46: 141–152. Matsushita N, et al. Gender difference in NASH susceptibility: Roles of hepatocyte Ikkbeta and Sult1e1. PLoS One 2017; 12: e0181052. Yatsuji S, et al. Influence of age and gender in Japanese patients with non-alcoholic steatohepatitis. Hepatol Res 2007; 37: 1034–1043. de Ledinghen V, et al. Diagnostic and predictive factors of significant liver fibrosis and minimal lesions in patients with persistent unexplained elevated transaminases. A prospective multicenter study. J Hepatol 2006; 45: 592–599. Louet JF, LeMay C and Mauvais-Jarvis F. Antidiabetic actions of estrogen: insight from human and genetic mouse models. Curr Atheroscler Rep 2004; 6: 180–185. Saglam K, et al. Effects of postmenopausal hormone replacement therapy on insulin resistance. Endocrine 2002; 18: 211–214. Wooden B, et al. Using big data to discover diagnostics and therapeutics for gastrointestinal and liver diseases. Gastroenterology 2017; 152: 53–67.e3. Goossens N and Jornayvaz FR. Translational aspects of diet and non-alcoholic fatty liver disease. Nutrients 2017; 9: E1077. Teufel A, et al. Comparison of gene expression patterns between mouse models of nonalcoholic fatty liver disease and liver tissues from patients. Gastroenterology 2016; 151: 513–525.e0. Tsuchida T, et al. A simple diet- and chemical-induced murine NASH model with rapid progression of steatohepatitis, fibrosis and liver cancer. J Hepatol 2018; 69: 385–395. Castro RE and Diehl AM. Towards a definite mouse model of NAFLD. J Hepatol 2018; 69: 272–274. Omary MB, et al. Not all mice are the same: Standardization of animal research data presentation. Hepatology 2016; 63: 1752–1754. Bebarta V, Luyten D and Heard K. Emergency medicine animal research: does use of randomization and blinding affect the results? Acad Emerg Med 2003; 10: 684–687. Kuper CF, et al. Integrated analysis of toxicity data of two pharmaceutical immunosuppressants and two environmental pollutants with immunomodulating properties to improve the understanding of side effects—A toxicopathologist׳s view. Eur J Pharmacol 2015; 759: 343–355. Holman C, et al. Where have all the rodents gone? The effects of attrition in experimental research on cancer and stroke. PLoS Biol 2016; 14: e1002331. © UEG 2018 Castro and Diehl. Cite this article as: Castro RE and Diehl AM. Mistakes in animal models of nonalcoholic steatohepatitis and how to avoid them. UEG Education 2018; 18: 30–34. Rui E. Castro is Principal Investigator at The Research Institute for Medicines (iMed.ULisboa) and Assistant Professor at the Faculty of Pharmacy, University of Lisbon, Lisbon, Portugal. Anna M. Diehl is Director of the Duke Liver Center, Duke Clinical Research Institute, Durham, NC, USA. Conflicts of interest: Rui E. Castro declares no conflicts of interest. Anna M. Diehl has received funding (research grants/clinical trial funding/consulting fees/lecture honoraria) from: Allergan, Boerhinger-Ingleheim, Bristol Myer Squibb, Cellgene, Conatus, Exalenze, Immuron, Intercept, Galectin, Galmed, Genfit, Gilead, Lumena , Madrigal, Metabolomics, Novartis, NGM Pharmaceuticals, Pfizer, Prometheus and Shire. She is working on a patent application associated with a prospective caspase target for NASH. Published online: October 18, 2018. A pdf of this article can be found in the UEG Library. Rui E. Castro is Principal Investigator at The Research Institute for Medicines (iMed.ULisboa) and Assistant Professor at the Faculty of Pharmacy, University of Lisbon, Lisbon, Portugal. He completed his PhD at the University of Lisbon and the Department of Medicine (GI Division), University of Minnesota Medical School, USA, in 2006. Since then, Rui has been combining his background in the modulation of liver cell function with his most recent discoveries in the miRNA field, to answer key questions on liver physiology and pathophysiology. In 2015, he was selected as a UEG Rising Star. Follow Rui on Twitter @RuiCastroHD. Anna Mae Diehl is Professor of Medicine and Director of the Duke Liver Center, Duke Clinical Research Institute, Durham, NC, USA. She obtained her medical degree from Georgetown University in 1978, which was followed by medical residency, a gastroenterology fellowship and professorship at Johns Hopkins University. The author of more than 250 peer-reviewed articles, she is also the recipient of many awards. Anna Mae is a physician investigator who has a longstanding interest in the liver injury and repair, particularly related to fatty liver disease. Townsend SA and Newsome PN. Mistakes in nonalcoholic fatty liver disease and how to avoid them. UEG Education 2017; 39–41. Cuperus FJC, Drenth JPH and Tjwa ET. Mistakes in liver function test abnormalities and how to avoid them. UEG Education 2017; 1–5. UEG Basic Science Course 2011. “Fatty liver disease: Update 2017” session at 25th UEG Week 2017. “Co-administration of probiotic with omega-3 fatty acids in NAFLD management: evidence from animals to randomized clinical studies” presentation at 25th UEG Week 2017. “NAFLD-NASH: Where are we going?” session at UEG Week 2016. “Obesity, non-alcoholic fatty liver disease (NAFLD) and liver cancer” presentation at UEG Week 2015. “Update on non-alcoholic steatohepatitis (NASH)” session at UEG Week 2015. "New hope for fatty liver disease" presentation at UEG Week 2015. "The role of microbiota in non-alcoholic fatty liver disease (NAFLD)" session at UEG Week 2014. European Association for the Study of the Liver (EASL), European Association for the Study of Diabetes (EASD) and European Association for the Study of Obesity (EASO). EASL-EASD-EASO Clinical Practice Guidelines for the management of non-alcoholic fatty liver disease. J Hepatol 2016; 64: 1388–1402. Chalasani N, et al. The Diagnosis and Management of Nonalcoholic Fatty Liver Disease: Practice Guidance From the American Association for the Study of Liver Diseases. Hepatology 2018; 67: 328–357. Vajro P, et al. Diagnosis of Nonalcoholic Fatty Liver Disease in children and adolescents: Position Paper of the ESPGHAN Hepatology Committee. J Ped Gastroenterol Hepatol 2012; 54: 700–713. Nobili V, et al. Indications and limitations of bariatric intervention in severely obese children and adolescents with and without nonalcoholic steatohepatitis: ESPGHAN Hepatology Committee Position Statement. J Ped Gastroenterol Hepatol 2015; 60: 550–561. Byrne C, et al. NICE guideline NG49. Non-alcoholic fatty liver disease (NAFLD): assessment and management. National Institute for Health and Care Excellence 2016. Further relevant articles can be found by navigating to the ‘hepatobiliary’ category in the UEG ‘Standards & Guidelines’ repository and via the EASL Clinical Practice Guidelines webpage.